This stray cat didn’t know where he was going, but he found himself breaking into a zoo one day. After climbing around the fence and making his way into the zoo, he somehow found himself making friends with one of the most unlikely friends ever! This homeless calico cat broke into the Leningrad (St. Petersburg) Zoo and after noticing a lynx inside of his enclosure, the cat decided to jump in with the lynx. Just moments later they became best friends and onlookers couldn’t believe their eyes. Luckily some zoo-goers were able to capture everything on camera for the world to see and nearly 10-million people have since seen the story. 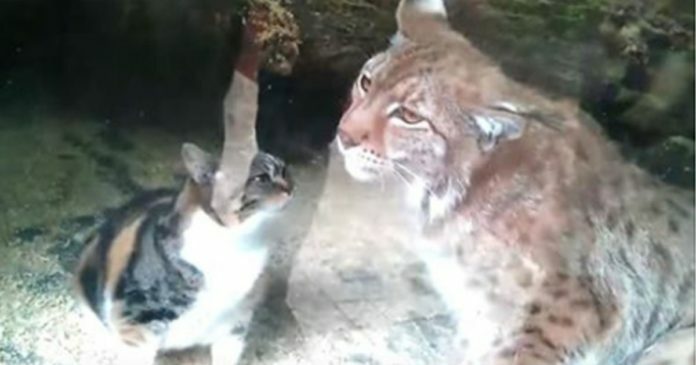 We’re not sure if the stray cat actually fell into the Lynx’s enclosure at St. Petersburg zoo, or if he willingly tried to seek out his unknown feline friend – either way we’re all amazed and you’ll be too when you see this amazing video below! Most people thought the lynx might attack the unknown visitor, but instead of ripping the poor stray cat to shreds, the most unlikely friendship unfolded right in front of everyones eyes and it’s truly incredible! Just watch the video and story! This is so wonderful when animals can get along in such a wonderful way, awwww!